Product #15959 | SKU NESSIE | 0.0 (no ratings yet) Thanks for your rating! 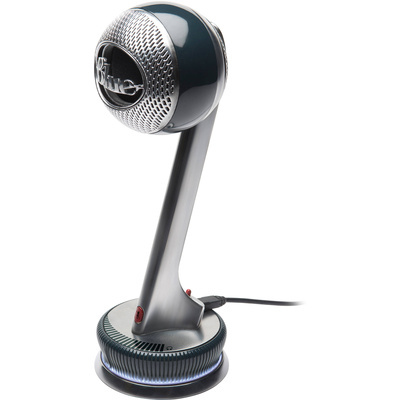 The Nessie by Blue is an adaptive USB microphone for desktop recording of vocals, instruments, voiceovers and more. Designed to address common pitfalls of recording, Nessie automatically adapts to the source, applying digital processing combined with a built-in pop filter and internal shockmount. Nessie enhances audio so that you get polished results. Nessie employs a single custom-tuned condenser capsule with a cardioid pattern. Its adaptive processing, including AEQ, de-esser and level control, automatically smoothes and refines audio in real time. Nessie also features a zero-latency headphone output for direct monitoring, which is critical for eliminating distracting delay. Headphone volume and instant mute controls are located directly on the microphone. Nessie is plug-and-play compatible via USB with both PC and Mac, no drivers required.